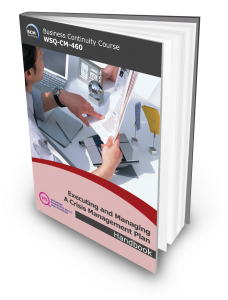 This 2-Day course is a follow-up course to the CM-360 Implementing Crisis Management Plan course. Participants are required to have attended and completed the CM-360 Implementing Crisis Management Plan before attending the CC-460 Executing and Managing Crisis Management Plan course. It is designed for emergency and incident management, crisis management and/or business continuity management team members who would like to have a more in-depth knowledge on how to manage a crisis. The workshop would allow participants to have the competency to allocate resources to handle a crisis, identify crisis response and recovery activities to be implemented, document activities and implement return-to-normal procedures, as well as communicate key messages to relevant stakeholders. Completion of the 2-Day course also allows participants to achieve an internationally recognised Crisis Management certification, .i.e. the Crisis Management Certified Expert (CMCE)* certificate. * To achieve the CMCE certification, participants would need to attend the last day of the Crisis Management Manager’s course and attempt the Qualifying CMCE examination and make payment of SGD250 as part of the Qualifying examination fees. Crisis Management Certified Expert (CMCE) certification is awarded to participants who successfully completed the 2-Day CM-460 Executing and Managing Crisis Management Plan course, attend the last day of the Crisis Management Manager’s Course, passed the Qualifying CMCE examination, sends in an application detailing at least 3 year of CM experience, make the application processing fee payment of SGD150 and satisfies and meets the experience requirements of the independent certification body. To train participants who do not have a crisis communication background and are in the emergency and incident management, crisis management and/or business continuity management team, to have the competency to handle a crisis situation. Examinations are only applicable if participants opt to attempt the Qualifying CMCE examination at SGD250. The CMCE Examinations is a 3.5 hours, 150 online Multiple Choice Questions done in an invigilated room either at BCM Institute’s designated exam venue. SGD150, applicable only for participants who attempted and passed the Qualifying CMCE examination and fulfil the CMCE certification requirements of having a minimum of 3 year of Crisis Management experience. SGD250 for the Qualifying CMCE examination fee.